This week has without a doubt been the week of DinoBoy! He has for a long time been jealous of the money that the girls ability to make money but at 8 he has been too lazy to do anything about it. A few weeks ago he asked me if I would help him to earn some money - as he wanted to boost his bank balance. In truth it was dwindling thanks to the Victorian Owl and Giant Turtle shell that are now taking pride of place in his bedroom. So I called the girls agent - put his paperwork in place and he got a call for the M&S casting the following week. They saw over 130 boys at the casting and DinoBoy walked it. We were surprised but thrilled for him. Then this week, ModelGirl was called in for a back to school campaign. Her agent mentioned to the client that they should see FunnyGirl and DinoBoy too - as they would be with me after school anyway. They weren't convinced but he went along anyway. The casting went well. FunnyGirl was funny and ModelGirl did what she does best. DinoBoy was just himself really. So when the phone call came the following day - I was shocked beyond belief at who they had chosen. Yep DinoBoy! It seems that the little fella really is Britain's Next Top Model! So moving swiftly on to something fun and funky. As you know I am doing a big search for good pressies for kids under £10. I have some great things that I know will have you full of inspiration but before I get my bargain head on I had to show you this. It's a really nifty bit of kit, that will bring you hours of interrupted fun (well it would me anyway). 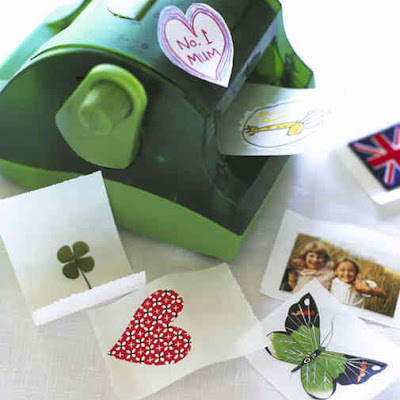 The Sticker Kit from Cox & Cox allows you to turn anything into a sticker - and I do mean anything. Fabric, flowers, photographs and sketches. You can use them to personalise just about anything and it comes with 7m of removable adhesive tape.